Although unlicensed, Kimo's is a fantastic and affordable restaurant based in Liverpool City Centre, about 5 minutes walk from both Lime Street and Central Station. They sell a mixture of English and Moroccan cuisine, and all of their meals are less that £10. In fact you'll pay under a fiver for most of their dishes. The food is fantastic and the portions are very generous. 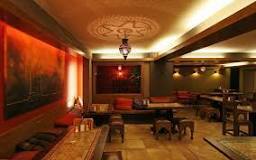 The service is great and the atmosphere is very chilled out and relaxed. I love sitting in Kimo's at night as the ambiance is great and if you can get a window seat you can watch the world go buy from the comfort of a couch and with great food and company. I would personally recommend the chicken and honey salad as this is my favourite dish off the menu. It's served with pita and croutons and is a healthy lunchtime snack, all for less than £5.